Web Design, Social Media, and Client Benefit Technology Experts. Our unique background working only in the Agency Industry is a huge advantage and time savings for the brokers we serve. We can help you build a website that is not only dynamic, looks great but also acts as a TOOL for sales and support staff to use to show services and products. You grow your business by referrals and relationships and having your marketing strategy a reflection of what makes your firm unique is the key. We support agencies with marketing items like: Social Media, Content creation, Email Campaigns and much more. 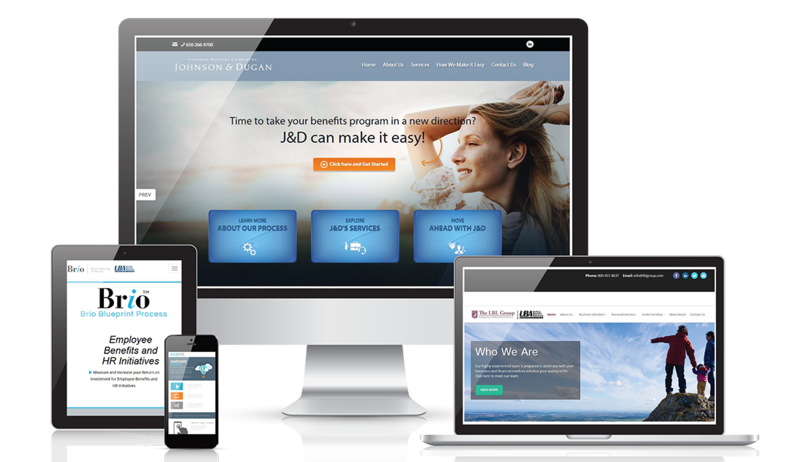 Every day since 1998 we have built and managed client benefit websites, custom portals and online Enrollment solutions. We partner with firms to handle the implementation and ongoing support to deliver the best technology to attract and retain employer groups. S imply put, our benefits background saves you time and money. eTekhnos is the nation’s only benefit industry-focused web design and internet marketing agency as well as an industry leader in providing custom client benefit portals. The benefit industry is very unique in its marketing and branding needs and having a technology partner based in employee benefits makes a difference. Having built over 2,000 client benefit sites, eTekhnos creates custom benefit portals that are developed and managed in-house so benefit agencies are not burdened with training, updates, or creative enhancements. eTekhnos provides demo and presentation services to proactively attract and engage new business for agencies of all types and sizes nationwide. Thanks for helping us meet the tight timelines of the site builds and being so willing and flexible to jump on all the the changes we have been sending your way!! It means a lot to us to have such a great partner in eTekhnos and we are thrilled with the results. Your support and team work has been outstanding and I wanted to make sure you all knew how happy we are with you!